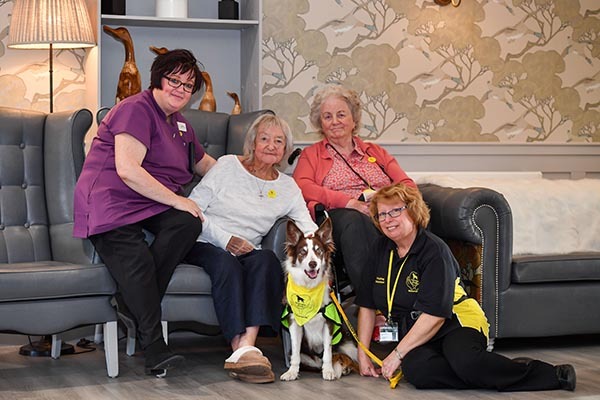 Residents at New Care’s Grosvenor Manor Care Centre on Heath Lane in Chester have welcomed into the care home a friendly furry friend in the form of Meg, the therapy dog. Proving a hit with all residents, Meg now visits the 81 bed care facility every two weeks with her owner Susan Caddell, who is from Chester, providing hours of fun. Enhancing the health and wellbeing of the residents at Grosvenor Manor, Meg offers companionship and friendship, emotional comfort and stimulation. From tricks in the communal lounges to visiting residents in their bedrooms, Meg puts a smile on all faces at Grosvenor Manor, with residents often asking when she is next coming in. In addition to Meg, Susan is a retired French teacher and whilst she is at Grosvenor Manor with Meg, has started teaching some residents the language, starting off with basic French, food and numbers, incorporating French bingo. Lisa adds: “We are committed to delivering purposeful and meaningful activities at Grosvenor Manor which enhance the quality of life of the residents. When we discovered that Sue was a retired French teacher, we immediately asked her if she would teach the residents French. Open for almost 12 months, Grosvenor Manor is a stunning state-of-the-art 81 bed care facility in Chester offering exceptional residential, nursing and dementia care services. Part of New Care, one of the UK’s fastest growing development-led care home operators, Grosvenor Manor caters for the aspiring needs of its residents, providing high quality, person-centred care in an expertly designed purpose-built environment. In addition to communal lounges, formal dining rooms and gardens, residents enjoy the privacy of their own well appointed and restful bedroom, complete with en suite wet rooms, and a host of hotel-style services including fine dining, a hair salon and nail bar. For further information regarding Grosvenor Manor, please call Dawn Collett on 01244 305330 or visit www.newcarehomes.com.